I can't wait for April 15. Good showing for Nelson as he looks to lock down the third base job — or at least earn the majority of the playing time — in his battle with Jordan Pacheco. In the second, Nelson tripled home the game's first run against a tough left-hander in John Danks. Six innings later, Nelson would single home the game's second run against another veteran left-handers in Will Ohman. I'm sure Jim Tracy will be filing those two productive swings away for when he makes out the lineup card against Wandy Rodriguez in six days. Alright, so he's not a Rockie — really, really, really wish he was — but how freakin' cool is it that the 19-year-old son of my favorite player growing up got an opportunity to play with the New York Yankees big club today? Oh, and nevermind the fact he hit not one, but two home runs in his two at-bats. One of them coming off a 10-year veteran in Brandon Lyon. Ya know, I think the kid's gonna be all right. Danks limited a Rockies offense not including Troy Tulowitzki, Carlos Gonzalez, Todd Helton, Michael Cuddyer and Jason Giambi to one run on three hits over six innings. Obviously this wasn't the best possible lineup Jim Tracy can field, but guys the Rockies will count on to hit against lefties — Dexter Fowler, Eric Young Jr. and Ramon Hernandez — were in there and contributed zilch (0-for-9). Todd Helton and Jason Giambi combined to go 5-for-6 with a home run, two doubles, two runs and three RBI against Yu Darvish. You think they give a crap about the hype? Just throw them your best and they'll figure it out sooner or later. Usually sooner. Yikes. We knew Darvish was going to present a challenge for the Rockies offense, but I don't think even a worst case scenario would have called for Carlos Gonzalez and Troy Tulowitzki to go 0-for-6 with six strikeouts.Yet that's exactly what happened. Did I already say yikes? Jordan Pacheco also contributed an 0-for-4 with two strikeouts and a GIDP. Not exactly the performance he was looking with the third base job now within his reach. Bad news: Chacin was roughed up a bit by a Texas Rangers lineup that has made back-to-back appearances in the World Series. Good news: The San Francisco Giants lineup will not present this type of challenge when Chacin takes the mound against them a week from Monday in the home opener. Nor will Barry Zito present the same challenge for the Rockies offense as Darvish did tonight. Three hits today. Scalding the baseball over the past week or ten days. Somewhere Wandy Rodriguez is wishing he didn't get that opening day assignment for Houston. A lot of debate today about Rosario's opening day status (and current value) after another multi-hit game raised his spring average to .474. I stayed out of the debate because I honestly don't know what his true status or value is. I just know that I continue hearing he's working hard, he's producing. he's maturing and that's all coupled with what nearly every scout has described as elite tools for a 23-year-old catcher. And honestly, that he's making all of us take a real hard look at his status and value this late in the spring likely solidifies both. I've overlooked Roenicke all spring and I apologize for that. Much like he did for the Rockies last season, Roenicke has quietly pitched nothing but quality innings. After his scoreless seventh today, he's now allowed only one run over nine and one-third innings. As Troy Renck pointed out today, he's out of options, and the Rockies might be unwilling to expose him to waivers. I guess that just put a little more pressure on Esmil Rogers to bounce back and Alex White to prove he's comfortable in the bullpen. The positive reviews on Rosario keep coming in, and he continues backing those up with outstanding results. This afternoon against a solid veteran right-hander in Gavin Floyd, Rosario went 3-for-3 — raising his spring average to .471 — including a double, RBI and two runs scored. He also nailed the only attempted base stealer, Alejandro De Aza — 12 steals in 54 games last season — and helped steer the Jamie Moyer ship on a day when he clearly didn't have it. It all adds up to another encouraging day for Rosario. He's had a rough spring and he couldn't finish the one inning Jim Tracy asked him to throw today (retired one but loaded the bases). That's concerning. He appears to be healthy, though, so that's good news. But what if he's setting up for a slow start to the season? That would be bad news. But he's also a veteran, so he could just as easily flip the switch and hit the ground running when it counts. How's that for non-analysis analysis? Edgmer Escalona — scoreless inning and two-thirds — continued his surge upward while Rogers took a step back this afternoon — 1 IP, 2 ER, 3 H, K. I still think Rogers has the edge if the two are battling for the same roster spot (he's out of options), but you can bet Escalona isn't going away. Also, the Rockies are committed to Alex White in the bullpen and White is committing to making the team any way he can. Rockies starter Jeremy Guthrie was having a rough enough afternoon on his own (four runs allowed through four innings). He certainly didn't need the assistance — or lack thereof — from outfielder Tyler Colvin on a Ryan Roberts' routine flyball in the fifth inning to make it worse. The flyball in question should have been the final out of what would have been a scoreless inning for Guthrie. Unfortunately, he, like the rest of us, looked on stunned as Colvin completely and inexplicably whiffed on the ball. Or I should say that was the initial reaction of Guthrie and others. Moments later, when everybody saw what actually happened on replay, the reactions changed from "Dude, what the hell?" to "Dude, seriously, what the hell?" only this time followed by belly laughs in the dugout. You see, what had happened was, as Colvin moved his glove into position to catch the flyball, a string on the top side of his glove got caught on a button on his jersey. The result was Colvin's glove not opening, his jersey coming untucked, the ball nearly hitting him *Kevin Harlan voice* right between the eyes, and another Arizona baserunner coming around to score. In baseball, it's rare to say "that's something I've never seen before"... but that's something I've honestly never seen before. Thankfully — as was pointed out several times by the announce crew, and later by Colvin when they miced him up in the dugout — it happened on March 27. That allowed all of us to enjoy it even more. Well, except maybe for Colvin, who will have a difficult time living that one down. On a day the Rockies offense was shut down by Diamondbacks prospect Patrick Corbin, Young at least did his part out of the leadoff spot reaching base three times (two hits and a walk). With the news you'll read about below, Young's chances of making the opening day roster have increased significantly. And I'm fine with that. He's played well this spring and earned the opportunity. But if he gets the spot he'll have to play well to hold on to it because Charlie Blackmon will get healthy eventually and Nolan Arenado is a candidate to be called up any time starting in June. Guthrie was due for his spring disaster start, so we'll acknowledge it as such, mark it down as a miss and move along. I was hoping Pomeranz would get to face the Angels projected opening day lineup. Thankfully, Mike Scioscia obliged with Pujols, Kendrick, Morales, Hunter, Wells, right on down the line to some guy named Iannetta. That's a big boy lineup, and it set up as a great test for the Rockies 23-year-old lefty. Well, Pomeranz pretty much breezed through the first two innings, with the only challenge coming from Pujols. Pomeranz won that lengthy battle that included a broken bat, a long, loud foul ball, and ended with a weak popout to third base on a fastball in Albert's kitchen. Fun battle. Pomeranz ran into some traffic in the third, which was actually perfect, because it forced him to bear down against the meat of their order with RISP. That's exactly what he did, striking out Howie Kendrick and getting Pujols out in front on a changeup to ground out to third. Another impressive sequence of pitching there. The Angels did scratch across a run against him in the fourth. The good news there is that Brandon Wood won't (or shouldn't, God forbid) be seeing any time for at second base during the season, so the soft grounder up the middle that he couldn't handle will be an out nine times out of ten, not a run. The only small downside is that Pomeranz reached his pitch limit (85) in the fourth inning, but all things considered — mainly the quality of opposition and the health of his backside — it was an excellent outing and an exciting afternoon for Rockies fans. The Rockies offense struggled with Reds ace Johnny Cueto early in today's game. Well, with the exception of Todd Helton, who connected for a pair of solo home runs — a second inning shot to right and an opposite field blast in the fourth. I actually decided to go back and watch the second one a couple more times just so I could admire it some more. It really was picture perfect swing on a pitcher's pitch down and away. Every hitting coach should have that swing on tape and show it to their pupils repeatedly. It was professional hitting at its finest. Blake desperately needed a moment that not only made himself feel confident heading into the season, but the Rockies coaching staff and myself as well. He had that moment in the fifth inning when he crushed a two-run homer to left off Cueto to give the Rockies the lead. It was a good step in the right direction, but my hope is the Rockies will continue to make Blake prove himself (health wise and on field production) before adding him to the opening day roster. I know the Rockies won't ask him to play 130 games, so that helps his cause, but they can't afford to have any dead spots on the roster like we saw for too many extended periods last season. Apparently White doesn't want to be overlooked in this bullpen mix. He was excellent today in his latest audition to be the bullpen's bridge guy (starter-to-late inning relievers), throwing two scoreless and striking out three. Among his victims: Drew Stubbs, Brandon Phillps and Joey Votto. All very good hitters. Pacheco led the Rockies offensive attack with three hits (all singles) this afternoon. Just another casual reminder that he can really hit and that he'll be traveling with the Rockies to Houston for opening day. Another start, another multi-hit game for the guy I'm now openly pulling for to make the Rockies opening day roster. Memo to Charlie Blackmon: You better get healthy relatively soon. Like yesterday. First his fiance takes to Twitter to praise Giants fans and elbow Rockies fans in the ribs. (A tweet she later deleted.) Then he goes 0-for-4 to drop his spring average to .125. Question to Dexter Fowler: How does a platoon with Charlie Blackmon or Tyler Colvin sound? Five RBI (four with two outs). Diving catch to rob a hit. 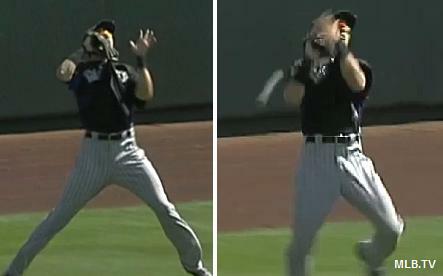 Just another ho-hum highlight filled day at the office for the Rockies superstar outfielder. Another multi-hit game for Colvin as he continues to build momentum in his quest for a bench role. Hitting coach Carney Lansford seems to think Colvin has cleaned up whatever was ailing his swing last season and early in this year's camp, so Charlie Blackmon's once thought to be secure spot could be in real jeopardy. Especially if his toe problem lingers another handful of days. Jamie Moyer had another really good day today...because his current #1 nemesis in the battle for the fifth rotation spot had a really bad day. Yes, Chatwood was slaughtered by a red hot Chicago Cubs offense, allowing nine earned runs on nine hits over four plus innings. His biggest problem? His inability to keep Geovany Soto in the ballpark (two home runs, five RBI), but a couple mental gaffes and general inexperience were also issues for the 22-year-old. 12 Giants up, 12 Giants down as Jamie Moyer rises from the ashes once again to become a real contender in the race for the Rockies fifth rotation spot. According to several people on site, Moyer topped out at 78 on his "fastball", but had a Giants lineup featuring several regulars off balance from pitch 1 to pitch 45, and probably would have been good for another inning had the Giants defense not kicked the ball around for a half hour in the fourth. We're one paragraph in and it's plainly obvious the Giants mailed it in tonight. Scratching Tim Lincecum and moving him to a minor league start all but confirms it. Anyway, it looks like the fifth starter race will end up going down to the wire, at which point the Rockies will decide if they want a veteran presence like Moyer to begin the season, a middle of the road placeholder like Guillermo Moscoso, or an upside play like Alex White or Tyler Chatwood. If I were a betting man, I'd save my money and wait to wager on a judgment not involving Jim Tracy. When Dan O'Dowd rebuilt the Rockies clubhouse this offseason, Marco Scutaro and Michael Cuddyer were the two most important bricks added from the offensive side of things. For Scutaro, it was a two-run double in the second that started the scoring. He also added a pair of walks hitting out of the lead-off spot. For Cuddyer, it was his first home run of the spring — a two-run shot in the third — and a single. Just in case you were still worrying about the veterans' struggles this spring, you can stop now. Both will be fine. Charlie Blackmon is day-to-day with inflammation in his right big toe. That opens the door for both Eric Young and Tyler Colvin to gain some ground in their competition, and both responded with excellent games today. Young actually led it off with a rare home run and later added a triple to really elevate his spring slugging percentage. Colvin doubled twice, singled, scored once and drove in two to help the Rockies hang around in a game where the pitching struggled mightily. If you took a peak at the scoreboard for the Rockies fifth rotation spot before today, you saw that Moscoso was hanging right in there, and maybe even had a chance to grab a firm hold on the job with a good outing against San Diego. Now take a look again — or maybe you'd be better off not to — because Moscoso's outing today likely bumped him down a peg or three. Granted, just about every starter across the board in Arizona and Florida will post an ugly outing or two, so I guess Moscoso (and the rest us) might be best off just washing our hands of this one and putting the focus on how he rebounds his next time out. Last week I told you to just assume Herrera was doing good things until you heard otherwise, but I can't help but acknowledge his big two-run triple tonight. It was actually a good offensive night all around for the Rockies starting lineup. Aside from Carlos Gonzalez — who will probably make up for this at a far more important time — every spot in the order contributed an RBI or run scored (Wilin Rosario pinch ran and scored for Ramon Hernandez, who left with a bruised knee after a HBP) in the first four innings. 3 IP, 3 ER, 7 H, 2 BB, 2 K and 70 damn pitches. Tonight was one of those nights where Chacin struggled to locate, missed few bats and the ball was carrying well, so the disappointing line is not all that difficult to figure out. I don't think there's anything here to be overly concerned about big picture unless the blister was a lingering problem. If so, he may need to take a few days off which would set back his progression towards opening day. Otherwise, just chalk it up to Arizona in mid-March. Escalona pitched well in 25 appearances with the Rockies last season and had been pitching well this spring until tonight. But tonight was not good (0.2 IP, 5 R (3 ER), 3 H, 3 BB, HR) and for a guy WITH options remaining in a crowded arms race, he needed this night to not happen. A good bounce back effort will be required. Aside from the rugged third inning where he dealt with traffic and was ultimately victimized by a good swing from a professional hitter — Howie Kendrick's three-run homer — Nicasio was excellent against a relentless, World Series contending Angels lineup this afternoon. And what I liked more than anything was the way Nicasio finished it. After allowing the home run, Nicasio closed it down with back-to-back 1-2-3 innings, and punctuated it with an overpowering strikeout of Albert Pujols. Honestly, the strike three pitch was so good it gave me chills. I knew little about Brown coming into camp, but I've learned recently that he hits right-handed and he's pretty strong. After an impressive game on Saturday that included a home run and double, Brown backed it up with an opposite field blast this afternoon. He's looking like solid AAA insurance. Dexter Fowler and Marco Scutaro combined to go 1-for-6 today and are hitting .080 and .130 on the spring respectively. Am I worried? Well, I'd lying if I said I wasn't a little worried about Fowler. This is a big year for him, and for all the stuff we read about how hard he worked this offseason, it hasn't paid off for him just yet. I'll be patient for another week or so, but you have to wonder how patient the Rockies will ultimately be. Charlie Blackmon and Tyler Colvin will give them options if things don't eventually turn around. With only four innings of play in the books, Pacheco's two walk day was easily the best among Rockies players offensively. He also gunned out an attempted base stealer named Chone Figgins (fast), so he definitely made the most of the limited action. The people of Arizona may disagree with me because they obviously needed the rain, but come on, it's a rare chance to watch some spring training action live and she ruined it. She could have waited at least another two hours! Chatwood's outing highlighted why the Rockies like him — three scoreless innings to start — while also reminding them why the 22-year-old will need some extra minor league seasoning before contributing. His fourth inning was little rough around the edges, and not exactly smooth on the inside either. The New Commercials are in! And they're starring Rockies season ticket holders, which is a pretty cool concept. And this one is pretty cool, too! Check out the rest at coloradorockies.com. Chacin had another strong outing today, tossing three shutout innings (only 44 pitches). He was scheduled and certainly positioned to go longer, but a "small" blister on his right index finger put an end to his afternoon. He'll get treatment for that and should be fine for his next scheduled outing. The Rockies top catching prospect locked and unloaded his second monster home run of the week. The first was a 400 foot plus shot off San Diego lefty Alex Hinshaw on Monday. 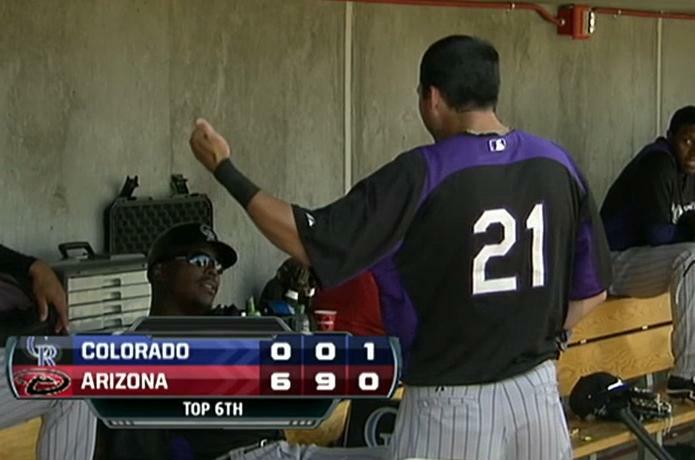 Today's was a two-run blast off former Rockie Rodrigo Lopez. Rosario's raw power is unquestionable, so it's really just a matter of adjusting to better pitching and staying disciplined. It sounds like he's making noticeable improvement in both areas so far. Hit the go-ahead two-run home run in the sixth that ended up being the difference. Think he's having a decent spring so far? I'd say so. It's not so much a miss because Paulsen is leaving camp (we all knew that was going to happen eventually), it's a miss because Paulsen is leaving camp before the manager's kid, Chad Tracy. That kinda sends the message that Tracy is higher on the team's depth chart, and that's a message I'm not comfortable receiving at this point. I guess he has some more time to prove me wrong (losing a popup in the sun today was a bad start), but I'd rather see Paulsen get some more meaningful reps to help prove me right. You can read the full list of first round cuts over at the Denver Post. As Bob Apodaca told the guys on KOA before the game, it's time to stop looking at Nicasio as a comeback story because that story is pretty much complete. Now it's time to evaluate him as a pitcher, and as a pitcher, Nicasio was rock solid tonight allowing only one unearned run on three hits over four innings. The only little blemish or concern was his inability to put a handful of hitters away, which elevated his pitch count. But that's quite a minor thing at this stage. Overall a very impressive and encouraging outing. His first inning three-run home run off Josh Collmenter will get the attention, but I was happier to hear his RBI single off left-hander Wade Miley. The Rockies need CarGo to get back on track against southpaws in 2012, so any progress/success there is worth mentioning. Also, it's safe to assume he's going to keep the bat companies busy again after tonight's original piece of lumber was unable to survive the punishing contact of both hits. Three more hits for the pesky utility man. Is it even worth mentioning anymore, or should we just assume Herrera is handling his business in March? The Texas Rangers fielded their big boy lineup this afternoon vs. Chatwood, and the Rockies 22-year-old held his own just fine with four very solid and efficient (50 pitches, 30 strikes) innings of one-run ball. He allowed four hits (two doubles), walked one and struck out a pair, and according to Troy Renck hit 94 on his fastball and 77 on curveball. He continued his tweet with "Chatwood has live, live arm, even if looks like could be in Little League." I don't think there's anything I can add to that. 3-for-3 (single, two doubles) with three RBI on the afternoon. He's now 7-for-15 on the spring. 2-for-3 (two doubles) two runs and an RBI. He's still my second ever but all-time favorite Rockies man crush. Dante Bichette was the first. Pomeranz was dominant in his abbreviated outing today, retiring all six batters he faced without allowing a ball out of the infield. Unfortunately, I was forced to use the word abbreviated because Pomeranz was forced to leave the game early with right hip tightness. That wouldn't appear to be a serious concern, but it does set him back a little bit in terms of his spring schedule, especially if he's advised to rest for a handful of days. Make sure to stayed to Troy Renck on Twitter for the latest. Belisle threw two innings of relief and was every bit as good as Pomeranz, allowing only one infield single, which was quickly erased by a double play. Looks like Matty B. might make the team again! We haven't mentioned Johnny Herrera a whole this spring but he was out there doing Johnny Herrera like things today against the Dodgers. That includes a pesky, two-out, two-run single in the second that pushed the Rockies lead to 3-0. He later muscled up for a double and also played some solid defense at short, reaffirming his versatility. Rosario capped Colorado's 8-run seventh inning with an absolute rocket three-run home run to straight away center field. And boy did it ever sound good coming off his bat. According to the Denver Post's Troy Renck, Rosario has worked hard to clean up his swing this spring and is also doing a better job of laying off breaking pitches. Hopefully he's able to maintain that discipline and the positive results continue piling up. With Casey Blake a late scratch due to being old, tired and barely able to move, Brandon Wood was gift wrapped another opportunity at third base on Monday. He took advantage of it by crushing more baseballs (single and RBI triple). Assuming Blake remains old, tired and unable to move, Wood will find himself getting more and more opportunities, which makes him one of the more intriguing players in camp. Keep watching (or reading). After Cameron Maybin took him deep to lead-off the game, Guthrie would allow only one single over his next four innings of work. That's good stuff. Of the 12 outs he recorded, three came via the strikeout and another seven came on groundouts. That's also good stuff. Oh, and again no walks allowed. That's great stuff. I've been a little rough on Chad Tracy this spring (admittedly unfairly so), so I will definitely acknowledge his go-ahead RBI single and sacrifice fly today. Those were actually two very good at-bats. A nice day for him and I'm sure a nice day for daddy as well. He's 49 years old. He can't touch 83 MPH on a good day. Yet he's retiring major league hitters with efficiency so far this spring, and he's NOT walking anybody. Lessons definitely to be learned there for young Rockies pitchers. I don't know how much Moyer has to give on the field, but I'll continue tipping my cap to him for professional performances like this one (Three innings, one run, three hits and two strikeouts). Speaking of professional performances from veterans, Marco Scutaro and Jason Giambi each delivered one of their own against Chicago. For Scutaro, it was a double, two walks and a run scored. For Giambi, a single, double, one run and one RBI. At this point, the only question for either heading into the season is how many games they'll be asked to play. Fowler hit a long right-handed home run the other day (I was impressed but not thrilled), but has done little else this spring. In fact, his 0-for-3 dropped his average to .071. It's not something to get worried about yet, but there's little doubt Fowler wanted to get off to a stronger start than this. We'll keep a close a eye on his progress. The Rockies offense is kind of sputtering along over the first week of spring training games, so basically any player with multiple hits will be recognized with a Hit until it starts to become a regular occurrence. In this case it was infield hopeful Brandon Wood, who singled, doubled, tripled and knocked home one of the Rockies two runs in three plate appearances. I had a really nice time at my cousin Kate's wedding on Saturday. The ceremony was presided over by their youth pastor, who played a part in introducing them 11 years ago, so it was cool hearing him tell their story with a personal touch and perspective. I also spent most of the reception tracking the Colorado/Arizona Pac 12 Championship Game with my cousin Andy (an Arizona graduate). He took the outcome well, but did not send along any congratulations. I wished them well in the NIT. After starting his spring with a Hit worthy outing last Xday, I noted that consistency would go a long for Friedrich if he planned on working himself back into the Rockies long term plans. Well, guess what? He took a step back. In three innings, Friedrich allowed four runs (three earned) on five hits and a walk. The three strikeouts were nice, but again it's the inability to string promising performances together that has everyone doubting what once seemed to be undoubtable (new word) talent. Nicasio's comeback story gets better and better with each passing day. For the first time since breaking his neck last August, Nicasio threw in a live game against live hitters and was largely successful, allowing only one unearned run on five hits over the three innings. But the numbers truly do mean little in this case, it's just awesome that Nicasio is healthy enough physically and mentally to resume his big league career. He's already the comeback story of the year. You probably won't see guys like Tulowitzki, Gonzalez or Helton listed here often since, you know, they're well established and we kinda know what to expect, but multiple extra basehits (two doubles) on a day the offense did little else is worth recognizing. Tulo remains a stud. The 38-year-old veteran, who at this point is fully expected to be the opening day third baseman, is off to rough start this spring. In his initial two starts, Blake has four plate appearances, and each appearance has resulted in a strikeout. Again, we shouldn't look at this too closely at this point, but Blake is definitely among the regulars who needs a good spring in the eyes of the fans. With Nolan Arenado already a huge fan favorite and breathing down his neck, there will be justified discontent if he's simply handed the job despite a lousy spring. Make that back-to-back strong outings to start the spring for Pomeranz. In today's outing he threw three scoreless innings, allowing two hits, walking one, and striking out three. To break it down a little further, he forced three groundball outs, picked the speedy Lorenzo Cain off first, and teamed up with Ramon Hernandez to have another speedy runner, Mitch Maier, thrown out attempting to steal second. Good stuff all the way around for Pomeranz individually, but that about covers the good for Colorado today. Outman's day was a miss, no doubt, but not the total miss it looked like it would be after his first inning. That first inning, which was the game's fourth inning, included the Royals plating four runs on five hits, with Yuniesky Betancourt's home run greeting him on just his second pitch. His second inning didn't start much better with a walk and single leading it off, but Outman did bear down at that point to retire six in a row. Again, not a good outing, but you definitely take note of his ability to collect himself and finish his three innings of work strongly. How a pitcher finishes his outing after a rough start is one of the few things you can actually take away from these spring games, so I wouldn't say Outman harmed his chances of making the team based on this. But he definitely needs to bounce back with a more complete performance his next time out. The big story involving the Colorado Rockies on Wednesday centered around the article Tracy Ringolsby wrote for Fox Sports where we learned more details about the departure of Ubaldo Jimenez last July. 1. He felt disrespected when the Rockies chose to extend Troy Tulowitzki and Carlos Gonzalez and not him. "I read in the paper that the Rockies said they were only going to sign two guys, they couldn't do three guys," Jimenez told FOXSports.com. "I was the third guy. They signed the two guys they were going to sign and they gave them more (years) and bigger (salaries). " 2. He arrived to spring training with the intention of being traded. 3. He forced himself to pitch through an infected cuticle on his thumb and a strained groin because "I was not going to get traded if I was on the disabled list." 4. He then continued to pitch with a fatigued arm for the Cleveland Indians after the trade. Listen, I can completely understand why a person would feel slighted when overlooked for a promotion or an opportunity they felt they earned, especially if they felt like the employer wasn't doing a good enough job communicating their plans and his status directly. It's not fun. Most of us have been there ourselves or we've seen someone close to us being put in that position, so it's very easy to sympathize with that. Hey, any time you can take Tim Lincecum out of the yard - spring training, postseason and all times in between - you've had a good day. So that means Blackmon's day was a good day just a couple pitches into the game as he led it off with a solo blast off the Giants ace. He then added a single, a stolen base and a run scored in the second, again off Lincecum, making it an excellent day. Jim Tracy wanted to get Cuddyer into the lineup today to get him a look at Lincecum. It didn't take him long to get comfortable as he knocked a two-run triple over the head of right fielder Nate Schierholtz to cap a three-run first. Cuddyer would later add a run scoring single, giving him a three RBI day batting out of the sixth spot. Opposite ends of the age and velocity table, but equally as effective on the mound today. Moyer tossed a pair of scoreless innings, allowing one hit and striking out one. Brothers followed with his own scoreless frame. Good start for each in active competition. The newer, stronger version of Dexter Fowler muscled up from the right side for his first home run of the spring. According to the Cubs radio broadcast the ball traveled over well 400 feet, so that's pretty impressive and maybe even encouraging. Unless, of course, you don't want your lead-off hitter swinging for the fences. Colvin's solid day began with an RBI groundout in the second. He then singled in the fourth and concluded his day with a triple in the sixth. That had to feel good for Colvin against his former club, especially on the heels of his three strikeout game on Saturday. He remains a guy to watch closely throughout spring training because of his intriguing upside and versatility. Moscoso's high flyball rate made his addition to the Rockies pitching staff a head scratcher this offseason. His performance on Tuesday did nothing to change that. Well, aside from maybe leading fans and writers alike from scratching their head to banging it on a desk repeatedly. Yes, the Cubs hit the ball in the air a few times again Moscoso in his two innings, including an Alfonso Soriano home run that traveled 450+ feet and struck the scoreboard on the fly, and a Brett Jackson three-run homer which capped Chicago's four run second inning. The Cactus League is officially underway with the Rockies sitting on a very NHL like 1-0-1 record. I invite you to check out my quick reviews of both games (Saturday and Monday). Of course there's always more than a few things going on off the field during the spring. Most of them fun, but unfortunately for the Rockies, they're dealing with not so pleasant off the field issues pertaining to Alex White and his DUI. I commented on the situation a little bit during Monday's game recap, but since then some new information has been reported by Patrick Saunders of the Denver Post. According to his report, White may be charged with an "extreme DUI", which would indicate his blood alcohol level was over 0.15. The Scottsdale police are awaiting blood test results before going forward with their changes, but unless his sample was left overnight in someone's basement refrigerator, White's probably got some trouble on his hands. Not to mention the fact he flat out told general manager Dan O'Dowd he only had a couple drinks before getting behind the wheel. DUIs, lying to the GM... yeah, not exactly the way you want to start a spring in which you're battling for a spot on a Major League roster. Now White has just as many questions surrounding his character as he did his performance, which usually means your days in Denver are numbered. I'll wait to see where this story goes from here before commenting further, but I reiterate that I'll support whatever the Rockies decide to do especially in light of the latest information. Baseball player. Good at-bats all day. Fine defense. We're two games in and I'm already ready to pencil him into the Opening Day lineup. Will it happen? Not likely. Should it happen? People smarter than me will say no, but I just know the idea is to have the best players on the field when the season starts, and I have a difficult time believing he won't be the best option at third base. We shall see. Big first outing for Friedrich as he looks to reestablish himself as a top level prospect and future fixture in the Rockies rotation. Over his two innings of work, he allowed one hit while striking out two, and according to Troy Renck, worked quickly and calmly throughout. For now, consider Friedrich a real longshot in the starting rotation mix, but that could easily change to sleeper if he strings a few more outings like this together. A little consistency will go a long way for him. Boy was it nice to be able to hear the crack of the bat and the pop of the glove. Baseball. Is. Back! 28 pitches over 2 innings for Pomeranz. He allowed 1 hit (a single) and a walk in the first frame but buckled down to escape without damage. His second inning was a very clean 1-2-3. Good start for him as he attempts to hold off several less talented pitchers for a spot in the rotation. His bat gets most of the attention but there's little doubt Arenado is developing into a big league caliber defender at the hot corner as well. He proved that on Saturday with a diving backhanded stab on a hot shot that appeared ticketed for the left field corner. Not only did Arenado field the ball cleanly to prevent a run from scoring, he also made the strong throw across to get the out. The Rockies waged war amongst themselves in an epic(ally titled) intrasquad game Friday afternoon in Scottsdale. It was Team Helton vs Team Giambi, and while the game counted for even less than a meaningless Cactus League game does (they could have at least allowed the winning captain to make the lineup card out all season), it did hold at least some meaning for guys who begin the spring on or outside the roster bubble and/or guys returning from injury. Rogers pitched two completely clean innings on the afternoon, needing only 13 pitches to do so. For a guy without options, without an inside track to a roster spot, who often struggles with his pitch count, an outing this efficient sure beats the usual. Good start for Esmil. The former first round bust with the Los Angeles Angels (think Ian Stewart, only right-handed) showed off his versatility today, starting the game at third base and also spending time at short and second base. According to those on scene Wood made a very good accounting for himself defensively at the latter two positions (not his strengths) while adding a two-run single. Good start for him.